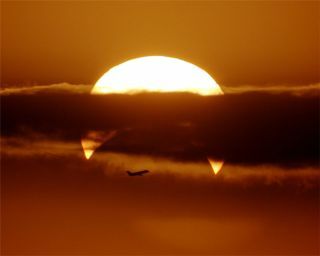 Phillip Calais took this image of a plane flying during a partial solar eclipse in early May 2013 from Monument Hill in Fremantle, Australia. He took this photo using a Canon 40D with Canon 400 mm f5.6 lens and a 2x teleconverter. The photo was taken at 7:05 a.m. and the sun was only about 1.4 degrees above the horizon. The moon will blot out the sun Sunday (Nov. 3) in an eclipse that will be visible from eastern North America to the Middle East. Sunday's celestial event is a relatively rare occurrence known as a hybrid solar eclipse. It will begin as an annular or "ring of fire" eclipse along the path of totality, then shift to a total eclipse as the moon's shadow sweeps across our planet. What you'll observe depends on where you live. Skywatchers in the eastern United States, northeastern South America, southern Europe, the Middle East and most of Africa will be treated to a partial solar eclipse, while people along the path of totality in central Africa will see the sun totally obscured by Earth's nearest neighbor for a few dramatic moments. All of the action in this part of the world will be occurring low in the sky, less than 8 degrees from the east-southeast horizon. (Your fist held at arm's length measures about 10 degrees.) So you'll want to find a spot that affords a good look at the horizon, without any buildings or hills blocking the view. The path of the hybrid solar eclipse of Nov. 3, 2013. The path of totality, meanwhile, starts in the Atlantic Ocean off the eastern U.S. and runs through Gabon, the Democratic Republic of Congo, and several other African nations before petering out in southern Ethiopia and Somalia around sunset. Warning: If you are planning to watch Sunday's solar eclipse in person, be extremely careful. Never look directly at the sun, either with the naked eye or through telescopes or binoculars without proper filters. To safely view solar eclipses, you can buy special solar filters or No. 14 welder's glass to wear over your eyes. Standard sunglasses will NOT provide sufficient protection. You can also build a simple pinhole camera, or look at the shadows filtering onto the ground through the leaves on a tree. (The spaces between leaves often create many natural pinholes). Editor's note: If you snap an amazing photo of Sunday's solar eclipse or any other celestial sight that you'd like to share for a possible story or image gallery, please contact managing editor Tariq Malik at spacephotos@space.com.